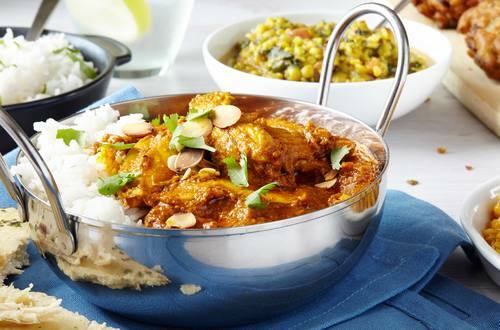 The lovely, creamy texture of coconut cream and Hellmann's® or Best Foods® Real Mayonnaise makes this chicken tikka masala recipe irresistible. 1 Process chili peppers, tomato paste, shallot, ginger, turmeric, garlic and garam masala in blender to make a paste; set aside. 2 Combine Hellmann's® or Best Foods® Real Mayonnaise with 1/4 of the chili pepper mixture in non-aluminum bowl or shallow baking dish. Add chicken and turn to coat. Cover and marinate in refrigerator, turning occasionally, 4 hours. 3 Remove chicken from marinade, discarding marinade. Heat oil in large non-stick skillet over medium-high heat and brown chicken, stirring occasionally, about 5 minutes. Remove chicken and set aside. 4 Heat remaining chili pepper mixture in same skillet over medium heat, stirring frequently, until slightly thickened. Stir in coconut cream and Knorr® Chicken flavor Bouillon Cube. Cook over medium heat, stirring occasionally, 3 minutes. Stir in chicken and cook, stirring occasionally, until chicken is thoroughly cooked, about 8 minutes. Garnish with cilantro and, if desired, toasted sliced almonds. Serve, if desired, with steamed basmati rice and naan bread. *Substitution:  Use 1/4 cup finely chopped onion.